Did you know that councils are paying farmers sums of money each year, to dump 'green' waste on their land? Farmers in the belief that they are doing the right thing for the community, are being conned, and having their land contaminated with plastic, aluminium, glass and all kinds of other products, containing chemicals and substances, which not only destroys the appearance of the countryside, but also puts at risk the health of wildlife and humans. Thousands of tonnes of this toxic rubbish, containing syringes, bottles, gloves, toys, glass - some of which will not decay for hundreds of years, to be tipped on the fields each year. Do your bit today and get this banned. Please sign today. antiquities dealer, TimeLine Originals, has announced plans to make a video celebrating some of the many detector finds that have passed through its offices and sales catalogues during the past twenty years. besides recovering major Treasure Troves. TimeLine has added unrecognized or unexpected value to detectorists� finds in other ways. 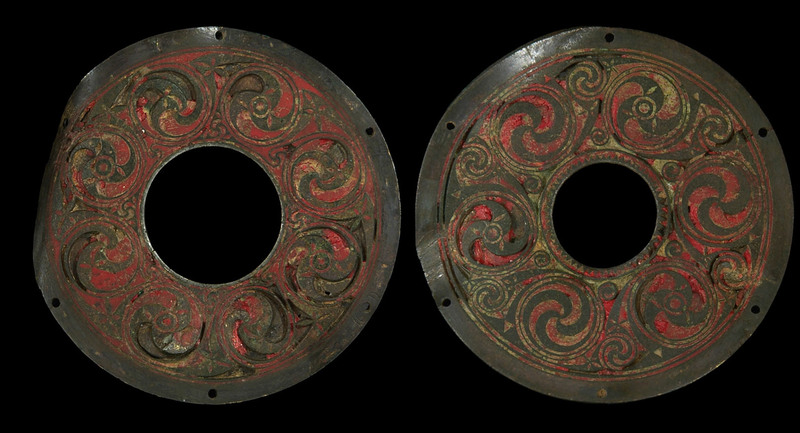 - an excessively rare pair of 7th century Irish Celtic enamelled roundels found in Norfolk. ultimately resulted in a hammer price of £21,000 at a TimeLine Auctions sale. Upminster it eventually sold for £2,700. of a 14th century Lincolnshire family. Bought for £3,600 in a TimeLine Auctions sale. we will be happy to give you our expert opinions free of charge�. Or contact TimeLine to arrange a time and place to meet one of our experts. Conservation work and TimeLine press publicity helped to boost the hammer price of these Celtic roundels to £21,000 at auction. Would you have put these Roman metal fragments into a junk pocket? Conserved and cleaned by TimeLine they sold for £120. Few signs of the superb surface decoration on this 10th century drinking horn mount were visible until we carried out professional cleaning and conservation at Upminster. It eventually sold in a TimeLine auction for £2,700. When first found with a coating of mud this scrap of bent lead might easily have been taken for junk. Cleaned and conserved it sold in a TimeLine auction for £2,000. Suffragette, sold for £180 at auction. TimeLine Originals & TimeLine Auctions. Two metal detector enthusiasts have been told by a coroner to settle a disagreement over a medieval seal. Museum experts are thought to have valued the seal, which was found in a North Yorkshire field and shows the murder of Thomas Becket, at £10,000. Carl Richardson and Richard Hunter, both from County Durham, are in an "equal shares" row over the find. 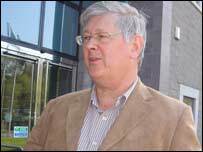 Coroner Geoff Fell, who was conducting a treasure trove inquest, told them to "sort out their differences". 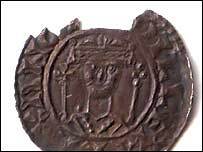 The seal was found buried in mud on a farmer's land near Catterick in North Yorkshire by treasure hunter Carl Richardson. But fellow enthusiast Richard Hunter insisted he was with Mr Richardson at the time and they had previously made a "gentlemen's agreement" to share the rewards of their labours. 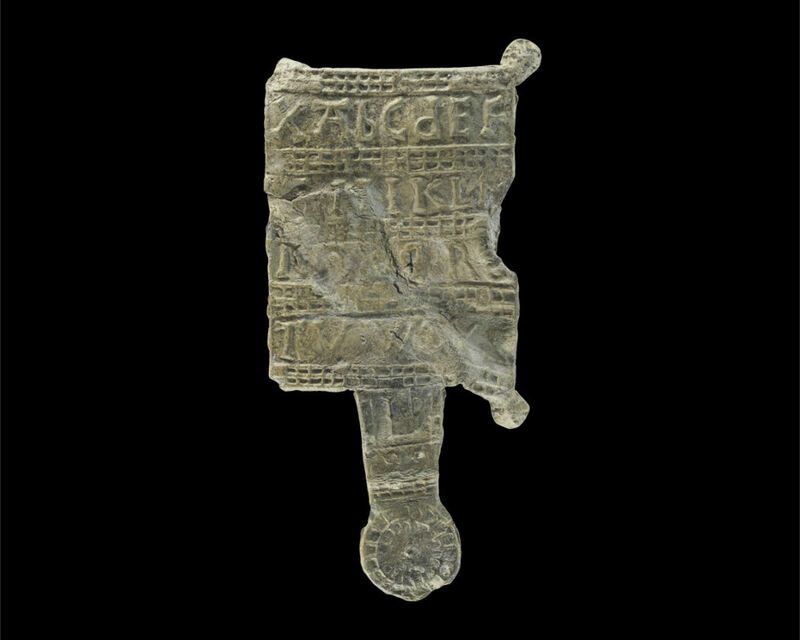 The oval silver seal matrix, dating from the 13th or 14th century, is now being looked after by the British Museum in London. It shows Thomas Becket and three knights, one of which is holding a sword above his head. Becket was made Archbishop of Canterbury in 1162 and was at odds with King Henry over the rights of the Church. He was assassinated by followers of the king in 1170 and venerated as a saint by the Roman Catholic Church and the Anglican Church. The seal was found in a field owned by John Wray, who had given Mr Richardson permission to use the land. Mr Hunter, from Peterlee in County Durham, told Coroner Geoff Fell he had met Mr Richardson a few weeks before the seal was found and they had been on a few outings together. But Mr Richardson, from Coxhoe in County Durham, who had been metal-detecting for 20 years, denied that Mr Hunter had been with him when he uncovered the seal in October 2006. Mr Fell said the case would be referred to the valuation panel of the British Museum but told the two men that they should aim to resolve their differences. "It's not up to me to decide ownership," he said. "If you cannot come to an agreement, then lawyers may have to be involved and that will be costly." Courtesy of BBC news online. A hoard of bronze age artefacts unearthed in Northampton have gone on show for the first time. The 50 items include ingots, tools and axes believed to be 3,000 years old. The artefacts are on show at the town's museum and art gallery whose experts said they show how bronze age skills in tool-making developed in the area. The amount paid for the finds was not revealed but most of the money came from grants to help museums purchase items of local historical interest. Rachel Silverson, from Northampton Museum and Art Gallery, said: "It's only through the efforts of these people that museums are able to purchase items like this and share them with the community." 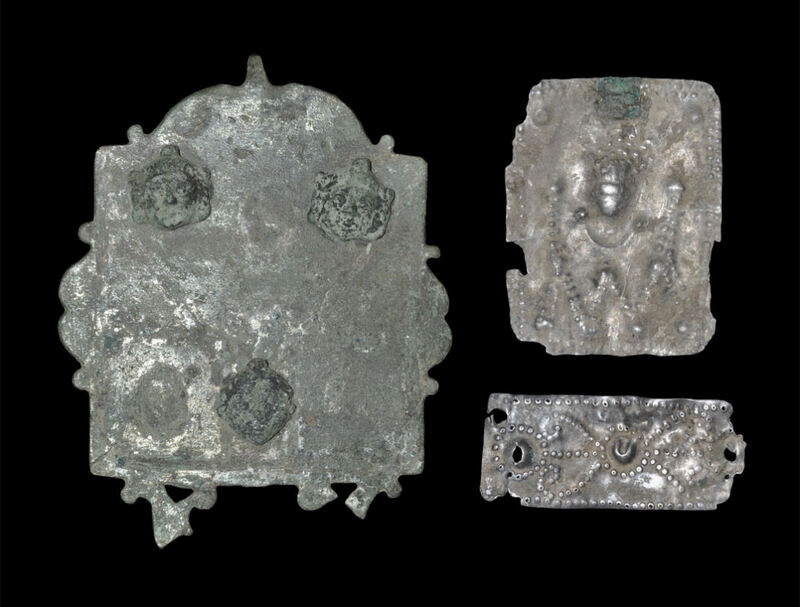 A 500-year-old silver pendant depicting images from the Bible has been unearthed on farmland in Pembrokeshire. No value was placed on the item but a treasure trove inquest at Milford Haven heard the National Museum of Wales was interested in acquiring it. Coroner Michael Howells heard coins dating back to the reign of Edward II had previously been found in the field. 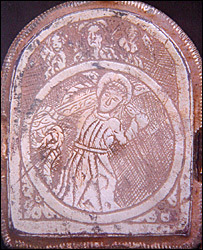 Experts said the pendant, which includes an engraving of the Passion of the Christ, had been dated to the early part of the 16th Century. Mr Lumm found it about four inches below the surface of the field. As it was a valuable object over three years old, the coroner said it was treasure, and Mr Lumm would be entitled to a reward. The most important Viking treasure find in Britain for 150 years has been unearthed by a father and son while metal detecting in Yorkshire. David and Andrew Whelan uncovered the hoard, which dates back to the 10th Century, in Harrogate in January. The pair kept their find intact and it was transferred to the British Museum to be examined by experts, who said the discovery was "phenomenal". It was declared as a treasure at a court hearing in Harrogate on Thursday. North Yorkshire coroner Geoff Fell said: "Treasure cases are always interesting, but this is one of the most exciting cases that I have ever had to rule on. "I'm delighted that such an important Viking hoard has been discovered in North Yorkshire. We are extremely proud of our Viking heritage in this area." Metal detectorists David and Andrew Whelan, who uncovered the treasures, said the find was a "thing of dreams". The pair, from Leeds, said the hoard was worth about £750,000 as a conservative estimate. 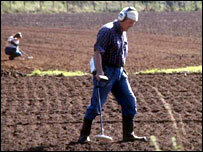 They told the BBC News website: "We've been metal detecting for about five years; we do it on Saturdays as a hobby. "We ended up in this particular field, we got a really strong signal from the detector... Eventually we found this cup containing the coins and told the antiquity authority. "We were astonished when we finally discovered what it contained." The ancient objects come from as far afield as Afghanistan in the East and Ireland in the West, as well as what is now Russia, Scandinavia and continental Europe. The hoard contains 617 silver coins and 65 other objects, including a gold arm-ring and a gilt silver vessel. Dr Jonathan Williams, keeper of prehistory in Europe at the British Museum, said: "[The cup] is beautifully decorated and was made in France or Germany at around AD900. "It is fantastically rare - there are only a handful of others known around the world. It will be stunning when it is fully conserved." One of Britain's most significant Viking treasure hoards has been unearthed by a father and son team. The collection, found in Yorkshire using metal detectors, consists of some 600 precious metal objects including coins, jewellery and other ornaments. Experts believe the hoard may have been buried by a wealthy Viking after AD928 during a turbulent period in the UK's history. Jonathan Williams of the British Museum said the find was "phenomenal". Metal detectorists David and Andrew Whelan uncovered the treasures at a site near Harrogate, North Yorkshire, in January 2007. Andrew Whelan told the BBC News website: "We've been metal detecting for about five years; we do it on Saturdays as a hobby. After the team reported their discovery, archaeologists began to carry out the painstaking process of excavating the objects. The conservation work revealed that the hoard was one of the most significant to have been found in Britain for 150 years. Dr Williams, keeper of prehistory in Europe at the British Museum, said: "The objects are absolutely spectacular." Among the treasures, archaeologists uncovered 617 silver coins, originating from as far afield as Afghanistan, chopped up fragments of silver bullion and a rare gold arm-band. 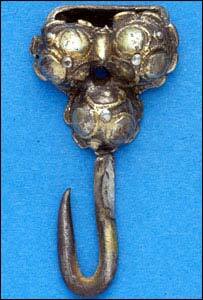 Dr Williams added: "There was also a wonderful silver gilt cup, which may well have been a Christian vessel. "It is beautifully decorated and made in France or Germany at around AD900. It is fantastically rare - there are only a handful of others known around the world. It will be stunning when it is fully conserved." Experts believe that the goods may have been buried sometime after the year AD928, during a period of unrest in Britain. At this point in history, the Christian English, based in the south, were pushing north to conquer the kingdom of Northumbria, ruled by the pagan Vikings. Dr Williams said: "The Vikings would have been on the run, and we speculate that a wealthy Viking would have buried his treasures in the ground at some point during this turbulent period." Researchers hope the objects will give them valuable information about the history of Britain during the early tenth century. The hoard, once declared a Treasure by the 1996 Treasure Act, will go forward for valuation by the Treasure Valuation Committee for the Department of Culture, Media and Sport. Dr Williams said that the British Museum and the York Museums Trust would be looking to raise the finds to purchase the collection so it could eventually go on public display. The proceeds would be split between the finders and landowners. More than 600 silver coins found on an Anglesey beach by a metal detectorist have been declared treasure trove by a coroner. The haul, dating from around 1272 will be valued before the finders are paid, and the items offered to the National Museum of Wales. The coins were collected over a six-year period at an undisclosed area of Llanddona beach. The Llangefni inquest heard it is a mystery how they ended up there. It is an offence not to report discovered treasure to a coroner. On Thursday, North West Wales deputy coroner Nicola Jones considered more than 600 coins which were part of a larger haul discovered by enthusiasts Graham Williams from Northop Hall in Flintshire and Chris Andrews from Guilden Sutton, Chester. In all, they have discovered more than 900 coins at the secret location. During one visit the men were walking back to their car empty-handed when Mr Williams' metal detector picked up a signal. They began digging and found 311 coins. 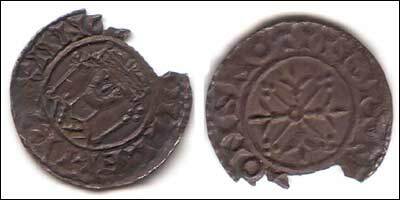 An expert from the National Museum of Wales confirmed the silver pennies were of the same type - mostly from England between 1272 and 1307, but also from Scotland, Ireland and Europe. Part of a previous haul is already in the ownership of Oriel Ynys Môn in Llangefni, and the museum has also shown an interest in adding the latest coins to their collection, the inquest heard. Mr Andrews, a semi-retired nuclear physicist, said: "We've always been lucky on our trips to Llanddona. "Sometime we've found them in groups, sometimes singly, and we still don't really know how they got there." Mr Andrews said some of the coins got his heart "pounding"
Coins were usually found along with something else which suggested how they got there, he added, but the Llanddona coins were a mystery. "We've found around 970 in total, but the sandbank has moved over the last winter to cover the spot and we've failed to find anything else there recently." The treasure hunters must now wait for the coins to be officially valued, but Mr Andrews guessed they could be worth around £4 each. "They aren't worth a great deal of money but as a scientist I am fascinated as to how they got there," he said. "The coins are sandwiched between a layer of sand and a layer of packed shells - it's a mystery how they got there." In a separate inquest the coroner decided a thirteenth century silver brooch, medieval brooch fragment and a post-medieval signet ring found near Beaumaris were all treasure trove. Buried treasures discovered by metal detector enthusiasts have been bought by a museum for more than £50,000. Bronze Age gold bracelets found buried at Foxley, Norfolk, will go on display at Norwich Castle Museum after The Art Fund paid part of the £35,000 price. 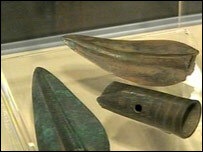 The charity has helped the museum to purchase a 145-piece hoard of Bronze Age weapons found at Eaton, Norwich. The museum has also acquired an Anglo Saxon sword pyramid used to protect weapons, found at Shouldham in Norfolk. David Barrie, director of The Art Fund said: "It's incredibly exciting when pieces like these are dug up from the ground after being buried for thousands of years. "It's great news that these three important finds have been purchased by Norwich Castle Museum where the public will be able to share in the excitement." 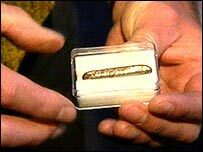 Norwich Castle Museum said they believed the gold bracelets made from metal from Ireland, Wales and possibly Scotland could have been a religious sacrifice by a wealthy man or they could have been hidden in the ground. 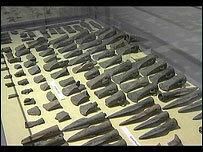 The Bronze Age weapons probably belonged to a metal worker and were intended for melting down or reforging. The Anglo Saxon sword pyramids were used like scabbards or harnesses to carry and protect the weapons. A metal-detecting novice who unearthed an "extremely important" hoard of Bronze Age artefacts has said his discovery was due to "sheer luck". John Minns, from Arbroath, Angus, made the find during a holiday near Berwick-upon-Tweed, Northumberland, in 2005, just after starting his hobby. 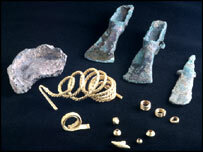 The hoard includes gold hair rings, bracelets, weapons and a bronze razor. It is going on display at Newcastle University's Museum of Antiquities until the end of June. It is intended that it will be exhibited to the public permanently from 2009 at the forthcoming Great North Museum. 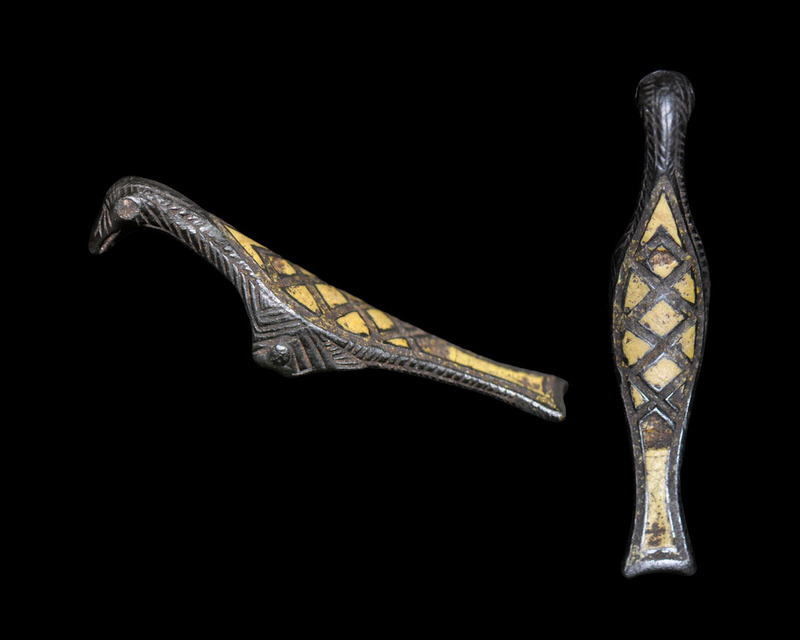 A Bronze Age razor - the first to be found in the county - was among the objects discovered. This suggests men living in the area between about 1000 and 800BC were clean-shaven. 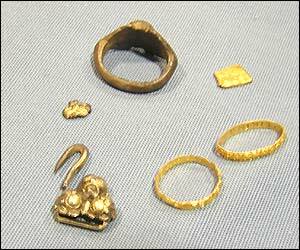 Gold lock rings, thought to have been hair decorations, as well as bracelets, rings, pins and axe heads were also found after Mr Minns was given permission by a local farmer to take the detector on to his land. Mr Minns said: "The only reason I found the hoard was that I got a nice signal from the detector, but when I dug away the soil, all I found was a yoghurt pot with a foil lid." However, his discovery arose after he re-checked the hole and discovered an axe-head. Lindsay Allason-Jones, director of Archaeological Museums at Newcastle University, said: "Hoards from the late Bronze Age containing such a variety of objects in such good condition are very rare in the north of England, so this is an extremely important find." And, on the issue of how the objects came to be buried together, she added: "It is hard to know whether it was meant as an offering to a deity, or whether it might have been a Bronze Age founder's hoard, which the owner hid, intending to come back for it later." Artefacts uncovered by metal detector enthusiasts on the Isle of Man are going on show. A new temporary exhibition opens at the House of Manannan in Peel, which will display both Manx items, and pictures of well-know recovered artefacts. Enthusiasts will also be offering advice on how to get involved. The exhibition, entitled Our Treasured Past - 30 Years of Metal Detecting in the Isle of Man, opens next weekend and runs until 5 March. Allison Fox, curator of archaeology for Manx National Heritage said: "The contribution that metal detecting has made to our understanding of the Isle of Man's past is an important one. "There are artefacts discovered in the national collections which help us to illustrate the Story of Mann and there are items reported to us that remain with their finder or owner to care for. "This is a great opportunity to see some of the items that have emerged from the soil or sand through metal detecting over the past 30 years." 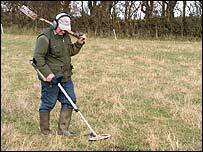 Archaeological finds in the UK have risen by 45% as a result of continuous work by metal detector enthusiasts, according to a report. In 2005/2006, there were 57,566 finds reported to the government-funded Portable Antiquities Scheme (PAS) compared with 39,933 in 2004/2005. Culture Secretary David Lammy praised the "responsible approach" of amateur metal detectorists in reporting finds. He said they were the "unsung heroes of the UK's heritage". Speaking at the British Museum on Wednesday, he said: "Thanks to the responsible approach they display in reporting finds and the systems we have set up to record them, more archaeological material is available for all to see at museums or to study online. "It is through the work of metal detectorists that we are encouraging the next generation to be interested in our history." The number of "treasure finds" - gold and silver items more than 300 years old - is also up from 426 in the previous year to 506. Significant finds in 2005/2006 include a series of Viking silver bracelets buried in Cheshire and a fourth century Roman copper-alloy dog found on the Isle of Wight. Children's illustrator Alan Rowe said the Roman dog figurine was the "nicest object" he had unearthed in 25 years of making finds. Because the dog, worth up to £600, is made of copper-alloy and not gold or silver it does not qualify as a treasure find. Under the Treasure Act 1996, people who find gold and silver objects more then 300 years old have a legal obligation to report them to the authorities. Despite the act, thousands of items claiming to be treasure appear on auction websites. Many of these items were fake, a spokesman for the National Council for Metal Detecting said. A rare Anglo-Saxon belt buckle found by a treasure hunter with a metal detector is going on public display for the first time. 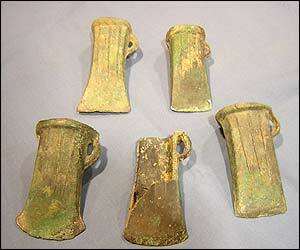 The copper alloy buckle dates from between AD600 and AD720 and is only the second one of its type found in England. It was unearthed recently on the outskirts of London by Bill Robson, who handed it to the Museum of London. The belt is rare because it is in a style normally found in Spain. Faye Simpson, community archaeologist at the museum, said: "This buckle is as beautiful as anything you could hope to find on Bond Street and would originally have been gilded - probably in gold or tin. 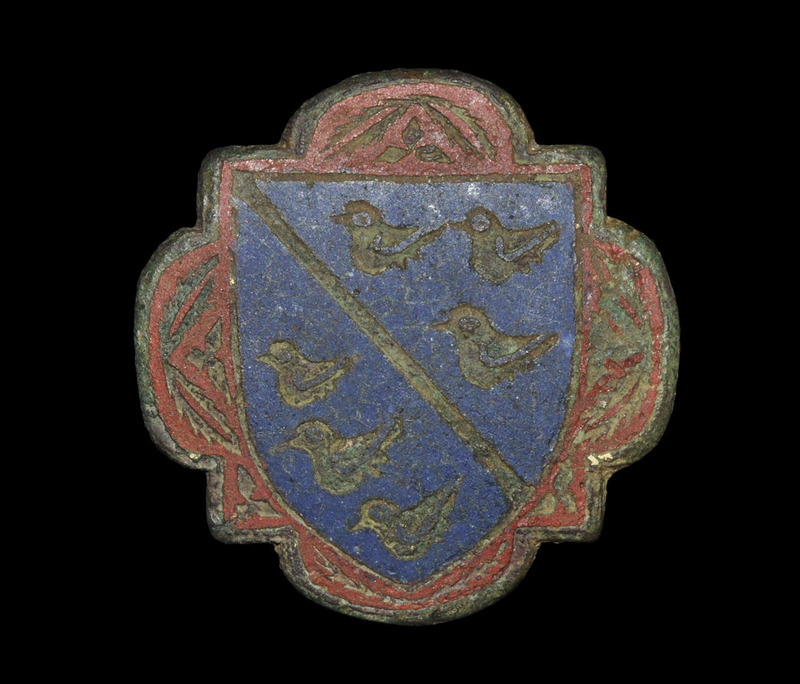 "This is a really exciting find, which has come to light through responsible metal detecting." A buyer has paid £460,000 at auction for a rare medieval gold coin which has broken the record for a British coin. The Edward III double florin, known as a double leopard and with a face value of six shillings, was circulated from December 1343 until July 1344. It is only the third known surviving coin, with two others found in the River Tyne in 1857. The price paid at Spink auction house, which included buyer's premium, was three times the estimate of £150,000. "We knew that there would be a huge interest, but this surpassed all of our expectations," said Jeremy Cheek, head of Spink Coin Auctions. The coin was bought by dealer Ian Goldbart, managing director of AH Baldwin and Sons, for Avarae Global Coins, a global coin fund. The coin - the first large gold one in England after centuries of silver ones - was found in February by a metal-detecting enthusiast in the south of England. The location is not being revealed to prevent an influx of other detectors. The coin - the first large gold one in England after centuries of silver ones - was found in February by a metal-detecting enthusiast in the south of England. The location is not being revealed to prevent an influx of other detectors. Farm contractors have unearthed 2,000 Roman coins beneath a field at a farm near Carmarthen. The coins, which date from late Roman times, have been categorised as "treasure". They contain a small amount of silver, but experts have not yet put a value on the find. The exact location of the discovery is being kept secret to protect the site from treasure hunters. The HM Coroner has been informed. The coins are thought to have been lying just 12 inches beneath the surface of a field. The Romans left Wales in 410AD, having first arrived in 47AD. Carmarthen was a Roman settlement from the first century AD. Coins of the late Roman period feature the standard head and tails, with a Roman emperor on the head and a goddess - of fortune, hope or chastity - on the reverse. The farmer, on whose land the find was made, said: "There are lots of wild rumours flying about but I don't really want to say anything. "The coins are at the museum now, and we are waiting to hear what happens next," he added. Edward Besley, of the National Museum of Wales, in Cardiff confirmed that the coins were at the museum and were being cleaned, examined and catalogued. He said: "When our investigations are complete, I will submit a report to the coroner who will then decide when to hold an inquest." Thousands of Roman coins will go on permanent display in Bristol after the city's museum was awarded £22,500 of lottery money. 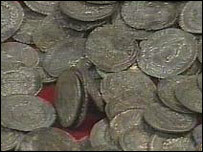 The hoard of 11,460 coins - the third largest found in the UK - was unearthed in 2004 by a gardener in Thornbury. Since the discovery, Bristol Museum has been seeking cash to put the copper and silver alloy coins on display. Grants totalling more than £40,000 have now been raised to keep the coins, which date back to AD 270, in Bristol. "We are delighted that the coin hoard is able to remain in Bristol and are able to give the public access to one of the most exciting finds in this area," said Kate Brindley, director of Bristol's museums, galleries and archives. A hoard of Roman coins unearthed in Suffolk is thought to be the largest discovery of its kind in Britain. Paul Flack, who had recently started metal detecting, discovered the find of more than 600 copper alloy coins in a field last October. 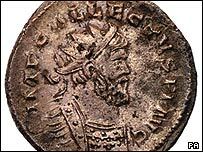 Experts say the find was of the usurper emperors Carausius (287-293 AD) and Allectus (293-296 AD). At an inquest, the find was declared treasure. The finder will be compensated for its value. John Newman, of Suffolk County Council's Archaeological Service, said: "This appears to be the largest hoard of legitimately-minted coins of the two usurpers from Britain to date. "The coins are made up of 258 of Carausius, and 347 of Allectus, minted at London and possibly Southampton or Colchester, which was the first time official mints were set up in Roman Britain." The coins are currently being kept at the British Museum, where they will be cleaned for valuation by the Treasure Valuation Committee. Mildenhall Museum hopes to buy the treasure. A hoard of Bronze Age artefacts which had been discovered in a garden has been declared treasure trove. The items which include spears, sword parts and axe heads were discovered in Shane Targett's garden in Eaton, near Norwich, last April. The 149 artefacts, which date back to 800BC, are believed to be from a local foundry and are worth about £10,000. On Wednesday, Coroner Bill Armstrong described the artefacts as a "significant and substantial find". The Norwich coroner declared the hoard a treasure trove because it was money or coins, gold, silver, or bullion, which was hidden or concealed and has been found by accident. Mr Targett, an amateur archaeologist, said: "It's just the end of a long and busy week, you stagger down your own back garden and you're pulling out pieces of history. "The edges were still sharp, in fact on the spears you could have easily cut yourself." The Castle Museum in Norwich is expected to place a bid to house the collection. The coin features the bust of William I. A rare Norman silver penny minted in Nottingham in the 11th century has been bought by Nottingham City Council. The coin featuring the bust of William the Conqueror, after he had been crowned King William I, has been added to the major collection of coins and medals at Nottingham Castle. 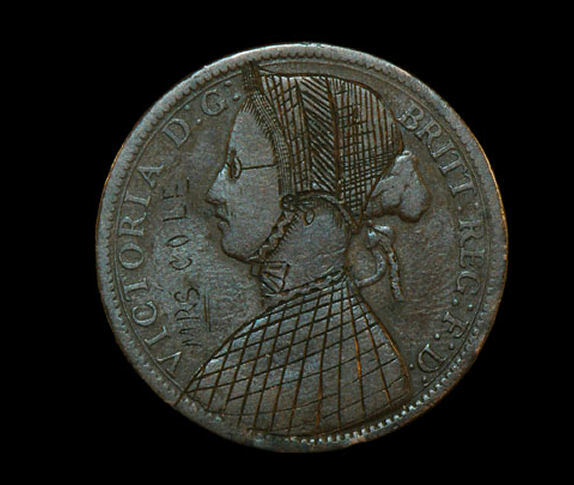 The penny was struck at the Nottingham Mint, which is believed to have been at Shelford, near Radclilffe-on-Trent. On the coin William I can be seen carrying two sceptres along with the writing M[AN] ON SNOTINGl, which is an early name for Nottingham. Eventually Ann hopes to be able to display the coin at Brewhouse Yard along with other �Nottingham Mint� pennies as part of the interpretation of the medieval castle. Obverse and Reverse of the old coin. Courtesy of BBC Nottingham news online. old gold ring in a field near Mold. Welding engineer David Robinson from Garden City, Deeside, discovered the artefact, thought to date from the 9th or 10th Century, in October 2004. 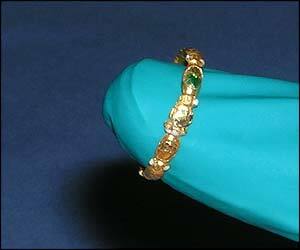 The ring was formally declared treasure by the coroner and will now go to a panel in London for valuation. The inquest was told the National Museum and Galleries in Cardiff was interested in buying the ring. The inquest in Wrexham heard that Mr Robinson uncovered the ring at Nercwys near Mold while out metal detecting with his friend Philip Rogers of Connah's Quay. The enthusiasts had found Victorian pennies and halfpennies in the field before. But then Mr Robinson's detector picked up strong signals and the ring was found about four to five inches below the field's surface. "On closer examination I realised what it was. I said 'I think I've found a gold ring and Phil said 'Yes, that looks like gold". Mr Robinson, who told the inquest that he was interested in Welsh history and had always wanted to find something old, said he had agreed with the landowner Richard Jones that they would share any proceeds. 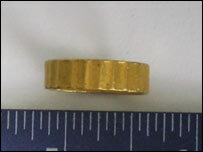 The inquest heard the artefact was later sent for examination to Cardiff's National Museum where experts found the ring, which weighs 5.63 grammes, was between 94% to 96% pure gold. Museum experts compared the ring with similar objects and on the balance of probability they had dated it from the early medieval period during the ninth and tenth centuries. Declaring the artefact treasure, deputy coroner for north east Wales John Gittins said it would now go to a valuations committee in London. Outside court Mr Robinson, who goes metal detecting once or twice a month, said it was the first time he had found anything of real worth. He said he had "no idea" as to the ring's value. A medieval gold ingot, found by Robert Hulse at Trefor near Llangollen while digging potatoes in his garden, was also declared treasure at the inquest. The property of a Viking raider has been seized again, this time by the state. A silver ingot and part of a brooch thought to date from the Viking era, have been declared 'treasure trove' after a court hearing. The items, which date from the ninth century, were found in 2002 on the banks of the River Bann near Kilrea by a metal detector enthusiast. The ruling means they are now in the hands of the state. They are 'treasure trove' because any silver object more than 300 years old is automatically in that category. Although the bronze brooch part would not be of the same value, because it was found alongside the ingot it means they are both likely to be historically valuable - so it was declared treasure trove too. Cormac Burke from the Ulster Museum said the place along the river where they were discovered is a well known crossing point and the Bann was a well known thoroughfare. He said that it does not mean there was necessarily a Viking site near by, and that the items were probably dropped. The Vikings, when not pillaging, founded Ireland's first towns, three of which (Dublin, Waterford and Limerick) were cities by the time the Normans arrived. The Scandinavian warriors featured in Irish life from about 800 to 1169, but failed to conquer much of Ireland because they were drawn into Irish dynastic disputes. The Burton collection of 14 pieces of gold and bronze jewellery and ceramic tools cost the National Museum and Galleries of Wales (NMGW) £85,000. 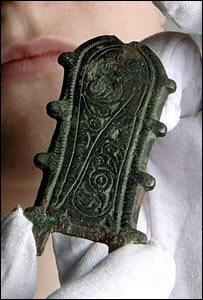 It will be exhibited alongside the Mold Cape, another priceless Bronze Age treasure, before returning to Cardiff. 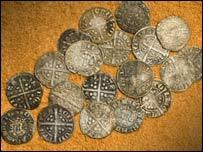 The hoard was discovered in 2002 by three friends from Liverpool metal detecting in fields north of Wrexham. It was declared treasure trove last year and the money the museum paid for it will be divided between the men who found it and the land owner. 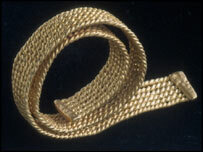 Included is what an expert from the NMGW said was a unique gold pendant as well as a gold wire-twisted bracelet, of which there is only one other example surviving in a museum in France. 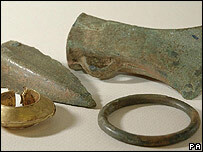 These and the other bronze and ceramic items are believed to date from the Middle Bronze age, between 1350 and 1100 BC. Adam Gwilt, later prehistorian at the museum in Cardiff said it was probable the jewellery was worn by its wealthy owners before being buried as some kind of gift to the gods. 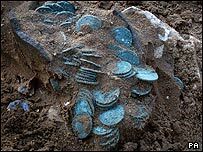 "What seems to have happened is that this hoard was carefully buried in the ground in the flooded river valley of the river Alyn. "At the moment, there's no known evidence of settlements in the fields around where the hoard was found. "It would suggest that the people were making a religious statement - maybe here it was about an important communication route". Half of the £85,000 paid for the Burton collection will go to the landowner where the treasure was buried, he said. The remaining half will be divided between the three men who discovered it. The treasure will go on show for the first time at Wrexham Museum next month alongside the Mold Cape, which experts have now dated to an earlier period of the Bronze Age, and which was found in a burial mound in 1833. The museum has been able to buy the Burton hoard with the help of a £21,000 grant from the National Art Collections Fund, another £35,000 from the Heritage Lottery Fund (HLF) and a grant from The Goldsmiths' Company. An amateur treasure hunter from Nottinghamshire who found a gold necklace has had it confirmed he will get a share of its value. Maurice Richardson found the 2,000-year-old torc in February with a metal detector near his Newark home. 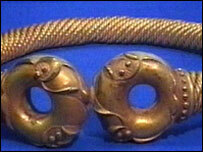 Gold torc now at the British Museum. An inquest has now declared the artefact to be "treasure". This means its estimated �100,000 value will be shared between Mr Richardson and Trinity College, Cambridge, who own the land where the torc was found. Despite the fact he could soon be significantly richer, the metal detector enthusiast says the most important thing about his discovery is its historic value. The location where the torc was found is being kept secret ahead of anexcavation by archaeologists. A collection of artefacts dating from the Bronze Age to the 1600s has been declared treasure by a coroner's court in Cardiff. 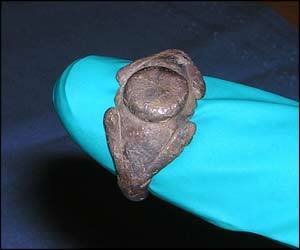 The items were found over the course of 18 months at various sites in the Vale of Glamorgan, south Wales. 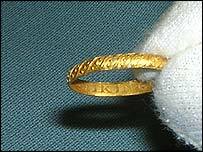 They included a gold Elizabethan ring with the inscription "Let Liking Last" on its inner rim, found near the ruins of a manor house in Llantrithyd. Five Bronze Age axe heads were also among items found by metal dectectors. The court declared seven items to be treasure, meaning it now becomes the property of the Crown and must be valued before it can be sold. 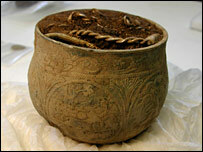 Archaeological staff at the National Museums and Galleries of Wales now hope to buy the items for their collections. A Romano-British silver ring and a 16th Century silver gilt dress hook were some of the other highlights of the finds. A second inscribed 16th or 17th Century gold ring was also found, bearing the legend "Where this I give, I wish to live" in italic writing. The museum's head of archaeology, Mark Redknap, said: "Many of the rings illustrate style and fashion in jewellery, dress accessories and they provide first-hand evidence. "For a lot of things, we rely on contemporary accounts or portraits but here we have the objects themselves. "Where they have got inscriptions we can see the use of letter styles." The artefacts also helped to make comparisons in fashion and styles between Wales, the rest of Britain and beyond, he added. Peter Halford, who found the first inscribed ring, was in court to hear the coroner's judgement. 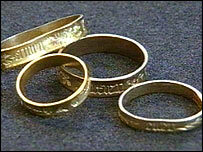 He came across the ring while out with his metal detector in February 2004. The psychiatrist from Talbot Green, near Llantrisant, had found two other historical artefacts during the two-and-a-half years since he took up the hobby, but this was the first one of value he had unearthed within Wales. "I was out with my metal detector just not finding very much as usual. I heard the signalling, dug down not very far, saw this glint of gold looking as good as the day it was lost. "I didn't realise how significant it was. I though it was something modern at first," he said. "Then I saw what I'd thought was dirt was enamel, which I knew you got on old rings, and I felt how heavy it was and realised it wasn't modern but a quality item." Dr Halford said he did not have any idea how much the ring might be worth. "I don't do it for the money. I think it's good more to feel a connection with the past. "I just wonder who lost it." He believes the owner was probably a young girl who either lost it accidentally or threw the ring away after an falling-out with whoever gave the item to her. "It was found near Llantrithyd Place and there may be a connnection with the house," he added. Four gold medieval rings which lay buried in a field in East Sussex for 600 years have been discovered by a group of people with metal detectors. The rings, which were in near-perfect condition and had hardly been worn, are engraved with romantic mottos. The find, in a field in Lewes whose location is being kept secret, is one of the most significant in Sussex. "It was incredible to have four of these beautiful rings together," said Sussex Finds Officer Liz Wilson. Billy Piggott was one of the detectors who found the rings "Just the one ring would not be that significant but the four together is really strange." The treasure was found by a group of amateur archaeologists from Bexhill and Hastings. "I broke open the clod of soil and at first wasn't sure what it was," said Billy Piggott, one of the detectors. "It was quite shiny and as I rubbed the dirt off and saw what it was it was just amazing." Finders of gold and silver objects over 300 years old have to report them under the Treasure Act 1996. 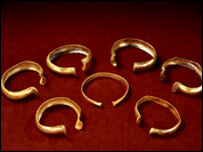 The rings were handed in under the Portable Antiquities Scheme and are being valued at the British Museum. The friends who found them plan to go on detecting and hope to find out who the rings belonged to and why they were there. "It is really exciting and I like to think that one day we can walk into a museum and say we found them," said Stephen Cook. All words and photographs �2004-2019 Detector Finds unless otherwise noted. All rights reserved. Copying or retransmission of text, images contained within this website without written consent of the copyright owner constitutes copyright infringement and is prohibited.